This is a blog about my journey with my new adopted rescue dog, Brutus. He is wonderful and amazing and crazy. Life will never be the same, and I wouldn't change it for anything. 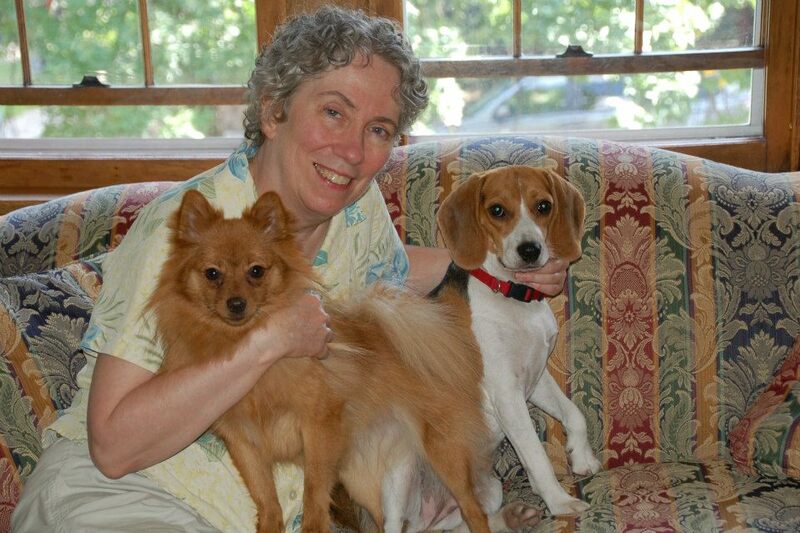 If anyone actually finds this blog, I hope it will encourage you to think about giving some love to a rescue animal. My motto has always been "Humans deserve twice of what they give to an animal, be it love or hate. As humans, we have the ability to think logically before we act. USE IT"!! someones' mouth. I know, that sounds incredibly mean, but I am seriously tired of hearing about how "I need to train Brutus". For cripes sake. If this certain someone who keeps telling me how I need to train Brutus had any idea how far we have come and from what we have worked with, I think he would shut his trap, at least I sure hope so. This is where it started. This summer I finally got Brutus to be able to go outside with me in the yard in the Cities without him leaving the yard. UNLESS, and it's an unless that I readily admit to, his favorite playmate is also out of his house. Then all bets are off. He has no control and feels the urge to run over and smell butts and run and play and mark territory like there's no tomorrow. Brutus's buddy will do the same thing, but here's the difference. 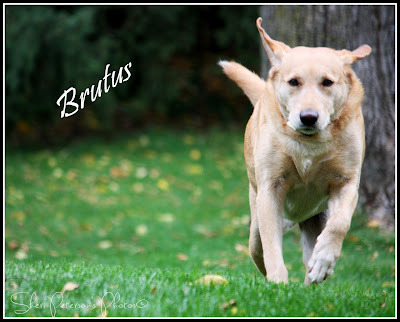 Brutus's buddy was raised from a tiny pup, and when his owner says "come" he actually does. Brutus wasn't in our household until he was at least two, was more than likely a failed attempt at a hunting dog and was probably trained by being electrocuted every time he didn't do what he was told. We made this assessment by the fact that just putting an e-collar on him and hitting the tone button brought him to the ground trembling. There was no electricity required. Before you panic, we never intended to shock him. Our intent was to train him with tones with the help of the seller of the e-collar. They are obviously not opposed to using voltage, but were very aware of our situation and didn't recommend it on any level. And, as always, I digress. All of that is documented in prior posts. It isn't pretty, but it's there. It's no wonder Brutus likes to drink! 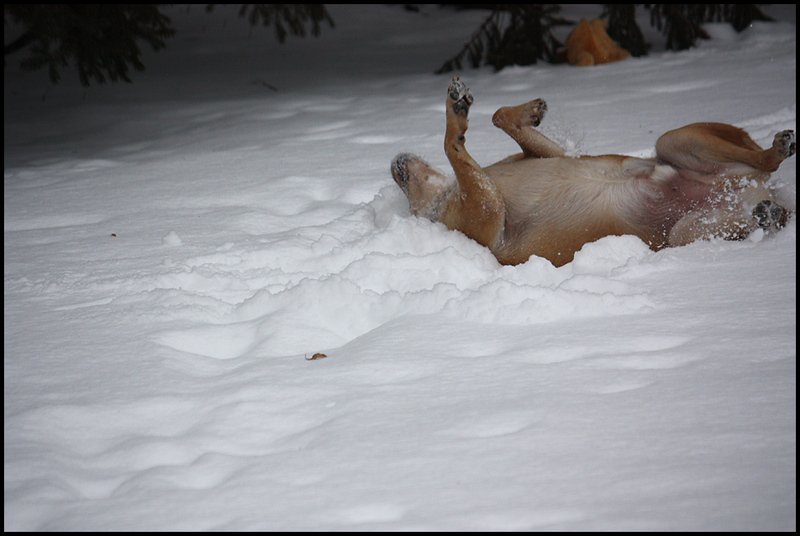 So, on one particularly lovely summer evening a few weeks ago, I took Brutus outside to go potty. I didn't realize that the neighbors were out back having a campfire, and before I could even get a hold of Brutus's collar he was headed next door to see his friend. His friend doesn't live next door, but he is always hanging out over there. I called for him a few times to come home and of course, he didn't. I was already in my pajamas with my makeup off, but over I went. Thank goodness it was kind of dark out! As I pulled Brutus away from his friend and apologized, my neighbor decided to blurt out that I "really needed to train him". If I would have been dressed and hiding behind the confidence of a good layer of mascara I would have verbally decked him, but instead I walked away. I was pissed. He has been told Brutus's story, so honestly, he was just messing with me. I'm sure that he thinks he would have the ability to train Brutus to come on demand. His boy dog also squats to pee and doesn't mark anything. I commend him on some pretty awesome training, but his dog also has the most laid back personality I have ever seen in my life. A squirrel could probably sit two inches in front of his nose and this dog wouldn't care. Here is where my pat on the back came in. 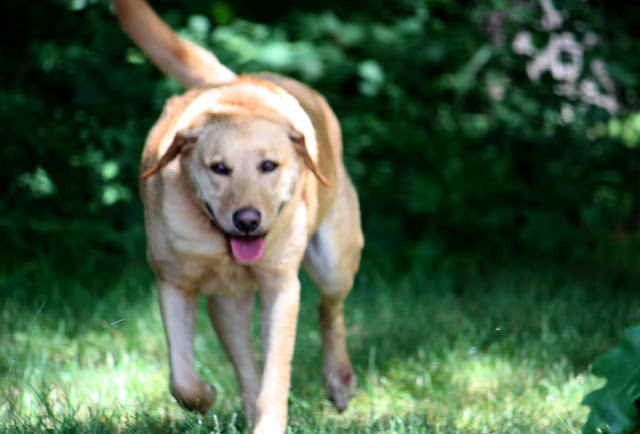 If you have read this blog from the beginning, you probably know that there was a time when Brutus would try to literally kill the veterinarian. Thanks to many non scheduled visits to the vet and the patience of an amazing staff, Brutus has gotten to be so much better about going in for his appointments. When I went to pick him up yesterday, the girl at the desk actually took the time to tell me what an adorable boy he had been all day, and he had been a love every time he was out of his cage. He hadn't growled or tried to kill anyone, and they had looked at him several times throughout the day. She had remembered his first visit, and him trying to bite the vet. It was traumatic. We had to muzzle him, I had to call Don to come and help and we had to give him two shots of tranquilizer just to get him settled down enough so he could be looked at. Don was upset, I was crying and Brutus was labeled as vicious by the end of that appointment. I am so thankful that his true sweetness is showing through. travel? You bet. Take that, neighbor who only adopts new puppies. Wow, that was super snotty. Oh well, it's my blog, and I'm feeling a little boogerish today. 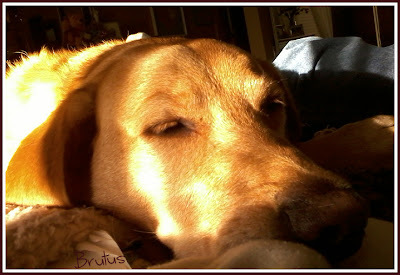 If you have followed this blog, you know that Brutus hates hates hates having his picture taken. All he has to do is see my camera and he'll go running, so in order to get his picture I have to be very tricky. Earlier this afternoon, Brutus was sunning himself on the front step (or waiting for Dad to get home and take him for a nice big walk) and I decided to grab my camera and snap a picture of him through a CLOSED window. Here's the terrible photo. The reason you're only getting one terrible photo of him resting in the sun is because he heard me through the window, popped his head up and knocked on the door to come in. I'm sure that he figured some picture taking stalker was after him outside. I seriously can't believe that he heard me through the closed window. Unbelievable!! For the past several weeks, Brutus has been fearful of going to the bathroom in the back yard. At night, he will often come back to the patio door to get one of us to stand out in the porch and watch him go potty. It's been weird to say the least. Then we figured it out. I was standing in the dining room one afternoon and I thought I saw a very large dog outside by the corner of our deck. After looking a little closer, I realized it wasn't a dog at all, but a very large coyote. I had heard from other neighbors that there had been a coyote in the neighborhood, but I had never seen it before and had no idea how large it was. Brutus weighs a good ninety pounds in the winter, and this guy, or gal, was just as big as he is. If I had a small dog or child, I would never leave them unattended. I'm sure that this coyote's scent is all over our back yard by now. I usually don't put Brutus on a tie anymore when I let him outside in the back, so he happily gets to do a really good job of marking all four corners of the yard, and a couple in the middle. 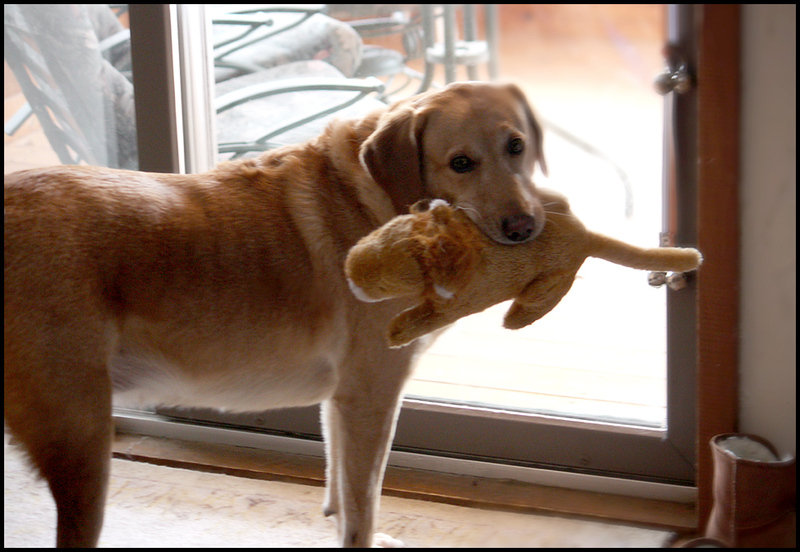 The other really adorable thing that he has started doing is taking a stuffed animal with him when he goes potty. I don't know if it gives him a feeling of not being alone, or if it's a peace offering to hand off to the coyote to give himself time to run, but either way, it's really cute. 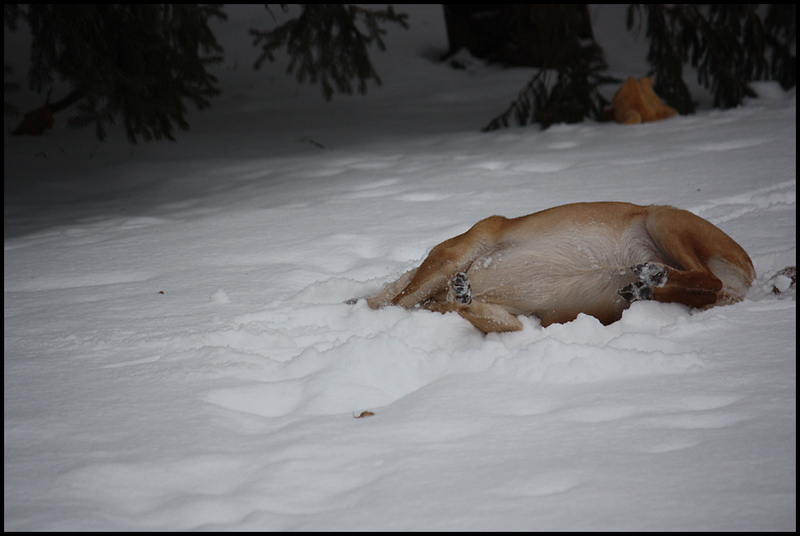 Other than that, today he just had a fun time romping around in the fresh snow. It's the closest thing he's had to a bath in the past couple weeks, so, it's all good. Have a great weekend!! Due to back and neck problems, I haven't been able to walk my Brutus boy since Spring. Needless to say, he has had a very big change to his routine, and hasn't been all that happy about it. 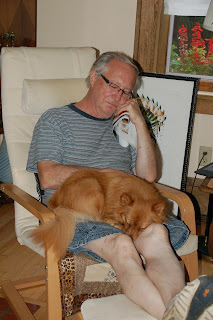 He's still been able to go to the lake with Don on the weekends, thank the gods, but during the week he just lays around the house waiting for his dad to get home from work. His inner clock lets him know to start watching out the window around 4:00. He may wait five minutes, or he may wait an hour and a half, but either way, when he sees that red truck turn the corner he goes flying. The weird thing is, after a quick "hello" he feels the need to grab a toy or bone of some sort and come running in to the bedroom where I usually am, and wait for Don to come in to say "hello" to me. Once that's done, then life is good. He'll chew on his bones, play with his toys and eat his food. Otherwise, forget it. He might as well be laying in a crate. This week I was putting the garbage out when it was close to the time when Don usually gets home. Brutus was standing at attention looking for him, which was adorable. As soon as the truck came around the corner he started jumping around and getting all excited. He was so beyond excited. 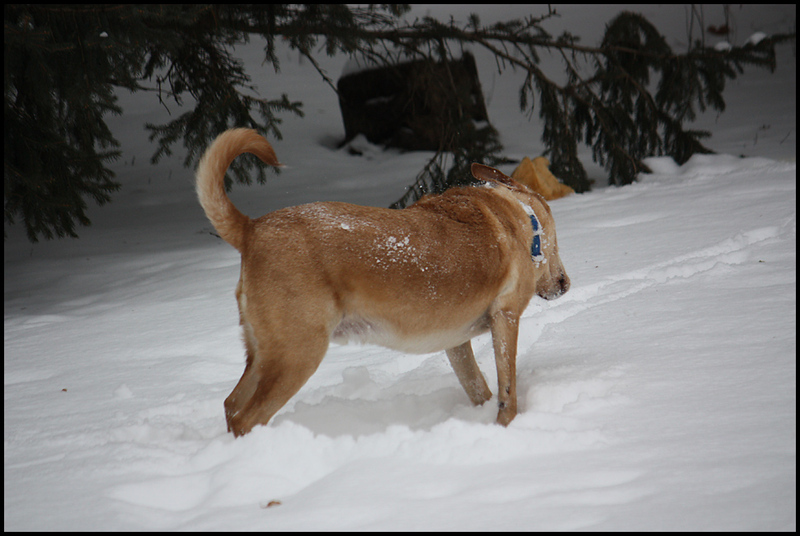 Don left his truck at the end of the driveway, and Brutus could hardly stay in his fur. If I would have been thinking, I would have taken him off of his tie. The next few pictures speak for themselves. Now that the Welcome Home is done, it's time to go find a toy. For some reason, there aren't any outside, so he grabs some cleaning cloths and comes running with those. 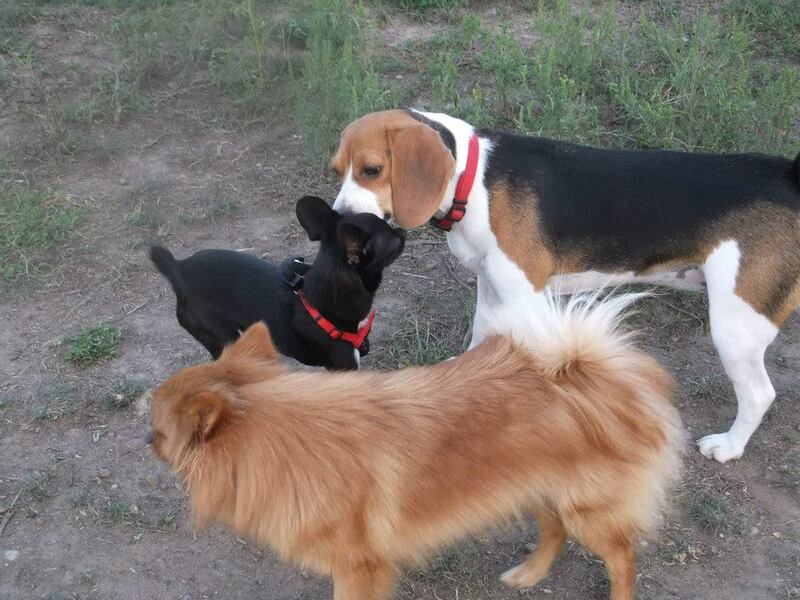 Several weeks ago, I received a lovely response to a blog post that I had written about Lily, the little Beagle that stole my heart, and her new brother Zep. We were unable to keep Lily due to the interaction between her and the cats, and to be honest with you, Brutus hated her. My cousin Janice who runs the animal rescue Paws of Jackson County, MN, was able to find a new home for Lily, and as luck would have it, it was with a dear friend of the family and her sister (also my cousin) Darla. I won't go back in to long stories of how it all went down, but let's just say that they are angels!! About the same time that this was going on in my life, there was a family going through anguish on what to do with a young dog named Zeppelin. I don't know the full story, but they finally had to make the decision to contact small animal rescue services, and Zeppelin was going to be rehomed. Well, as luck would have it, Zeppelin was placed in the home of Roger and Darla. So now, Lily and Zeppelin live and play and love together. 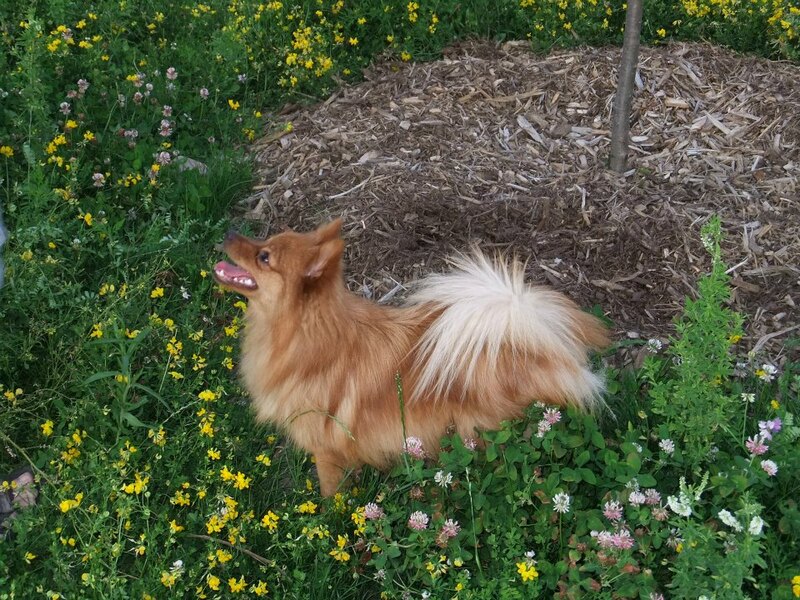 I am putting this post up here because Zeppelin's new parents would like to reach out to the previous owner, and let her know that they would like to have contact with her. It can be on Facebook or email, or whatever works. They just want to be able to share pictures, and to let her know that Zep is doing OK. If you see this message, and have any interest, just leave me a note on here. It will go to my email. 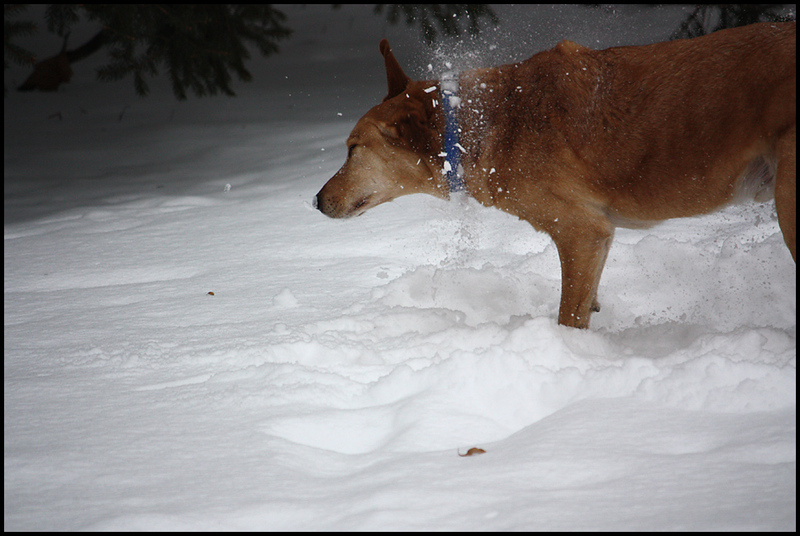 I know that I've already put some pictures up today, but Brutus and I went outside to play this afternoon and I actually managed to snap some pictures of him in action. He's so camera shy that I just couldn't resist sharing. 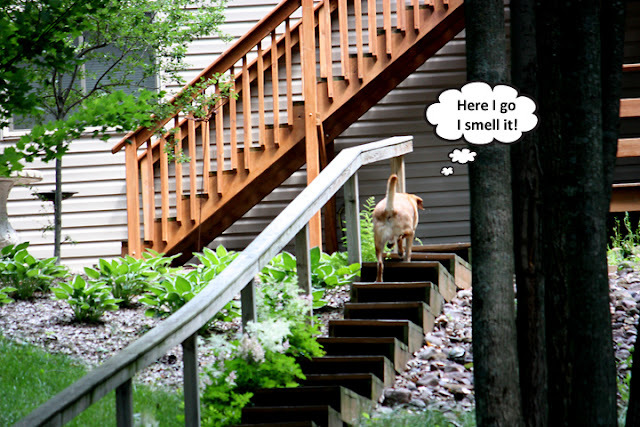 We no sooner got around the back corner of the house and to the steps down to the lake when he smelled a chipmunk. 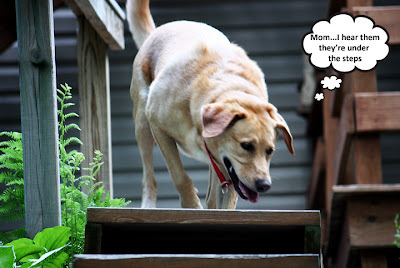 They love to play under the deck and steps, and even though he's way too big, he's been known to crawl completely under the deck on his belly and come out the other side just to get one. I'm sure they probably run at a much slower pace to laugh at him as he's crawling on his belly in a space that's only big enough for a big cat. He zipped around for quite a while going up and down the steps. Watching him made me tired. I'm not sure if the steps are so tiring because there are quite a few of them, or because the previous owner who built them made them so crooked, but they're a bugger! They're also narrow, so you need to hold on, especially after a few cocktails. 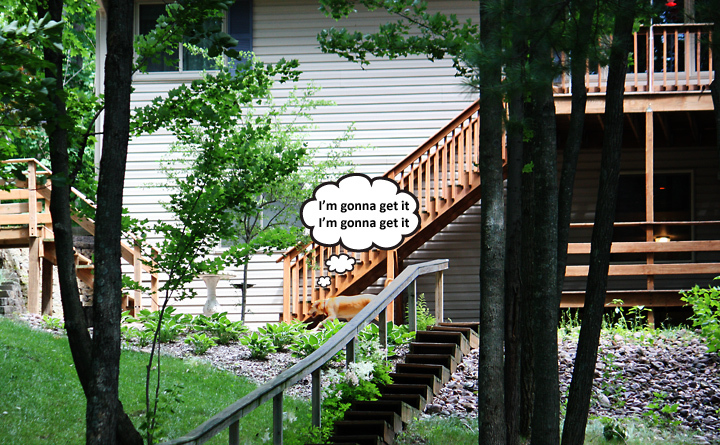 We've gotten the giggles on those steps more than a few times, and sometimes it's best to just sit down! Anyway, I finally just left him to play chase and went out on the dock. 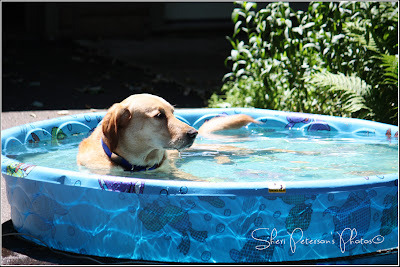 After about fifteen minutes he must have gotten hot, because he came running down the hill to go for a swim. 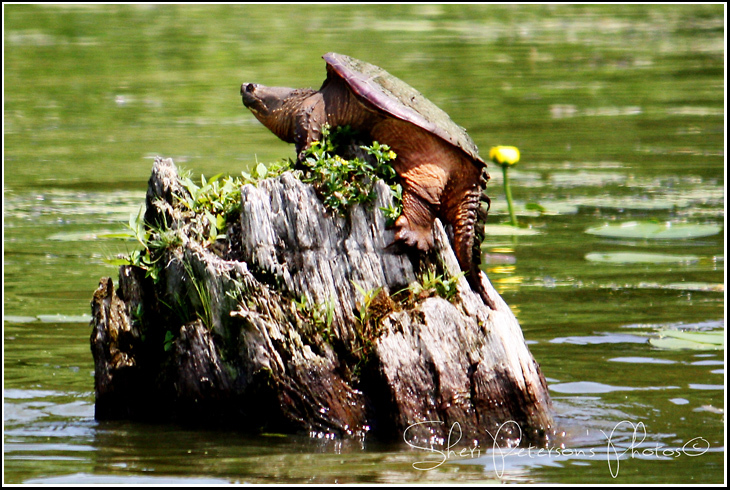 He saw me pick up my camera, and I was sure that he was going to jump right over the bank and skip the dock all together so I couldn't take his picture, but I got him! He's fuzzy, but I got him. 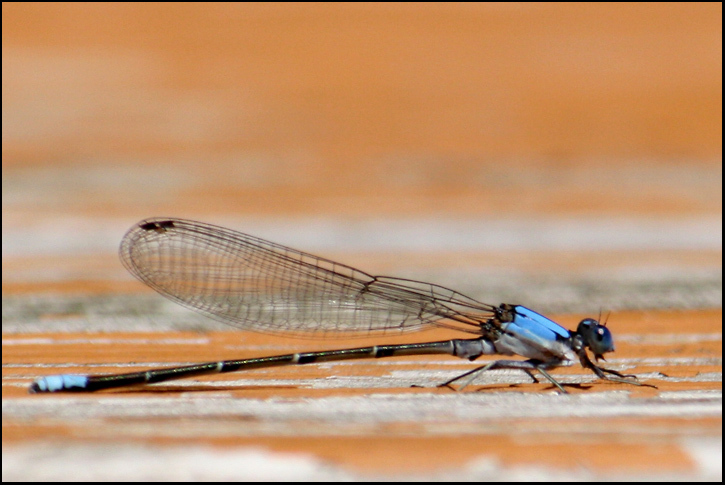 He jumped right over this little Damselfly on his way by. She didn't even move. I wonder what it feels like to be almost invisible and have a 90 lb. dog jump over you. 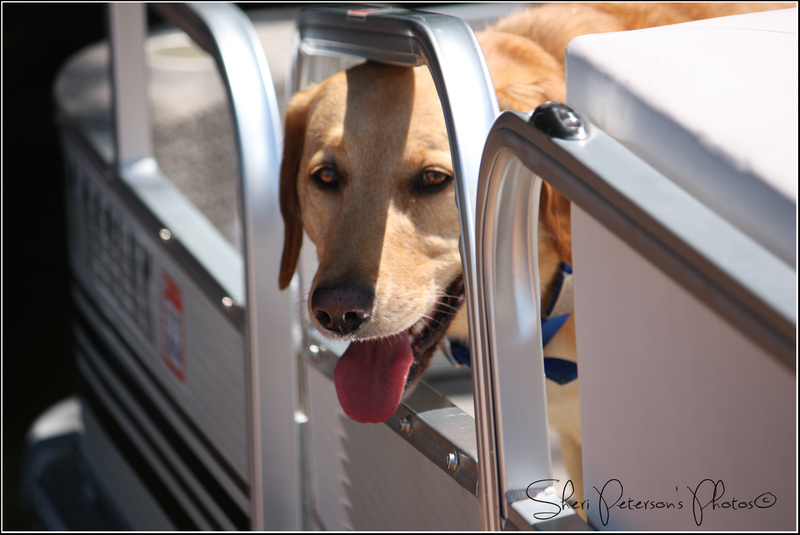 Then it was time to cool off in his favorite spot...under the pontoon. I don't know why this is where he always goes, but he does. Probably to hide from my camera! 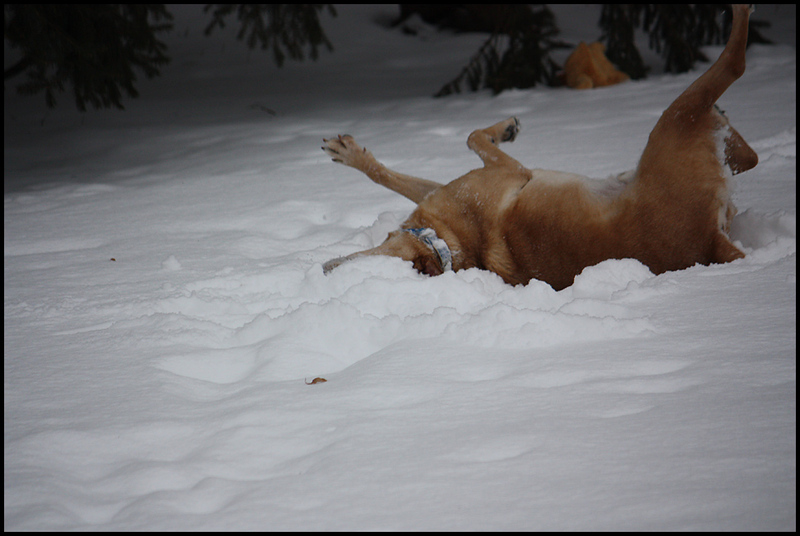 He cooled off for about five minutes, and then he was back up the hill to get the chipmunk. This time I went with him. I knew that he would end up in his pool, and I wanted to be sure to get a little skin soothing shampoo on his belly while he was in there. I've been walking him on a short walk in the morning, and the deer flies are eating his belly alive. Add to that the fact that the lake is extremely gross right now from the heat and the many inches of rain that we've had in the last three days, and I just wanted to make sure he got cleaned up. So, we headed up the hill. Instantly his nose was tracking again. He just cracks me up. He stepped right over this young lady on her way up to the road to lay her eggs. I think that she forgot to take a shower before she left home. ;) She looked a little grumpy too. Brute never did get the chipmunk, and since he's brought me my rodent quota for the month, I was completely good with that. He had a little swim in his pool, had a nice little bath (also in his pool) when he was done, and is now sound asleep at my feet. It was a pretty awesome afternoon in Brutus land. I hope everyone out there had an awesome afternoon too. Last Sunday was a beautiful day for a boat ride, and it was my first pontoon ride of the season. Apparently Brutus had been out fishing with Don the weekend before that, and he remembered the routine as if winter had never happened. He did have one moment of panic. 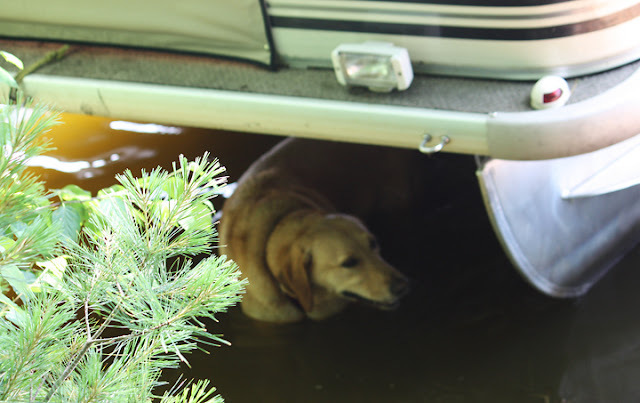 He had jumped in to the lake for a quick swim, and then jumped on to the boat with us. The problem was, Don's parents were on the boat with us too, and Brutus hadn't shaken the water off of himself. I knew him well enough to know that he would walk right over to them and shake away! Don coaxed him off of the boat and told him to "shake". 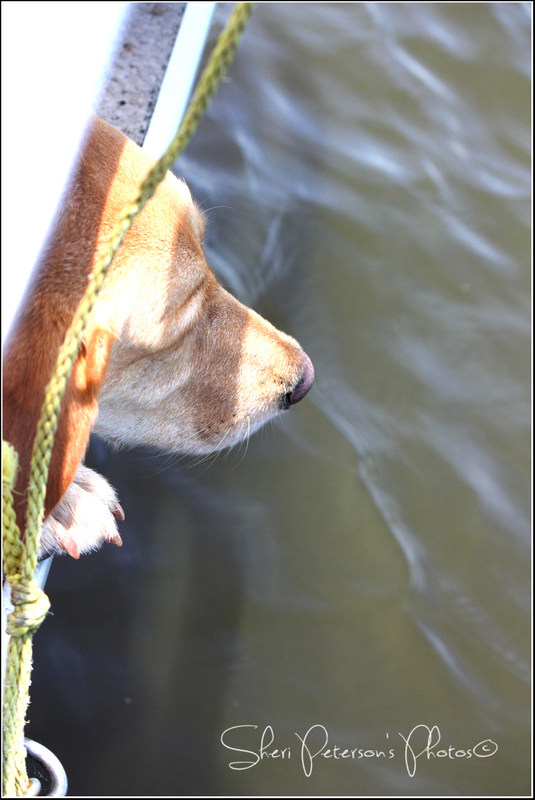 He was so confused, and when he was standing on the dock the little door on the pontoon started to close. He panicked, thinking that we were going to leave without him, and he actually tried to jump through the little space at the top of the door. We got his head unstuck and let him on the boat, and of course, he walked right over to Don's parents and shook the water off of himself. Oh well. Thankfully it was a nice warm day. For a while Brutus stood up and let the wind blow in his face, sending his ears flying in the wind like Dumbo's, but then he did something that I haven't seen him do before. 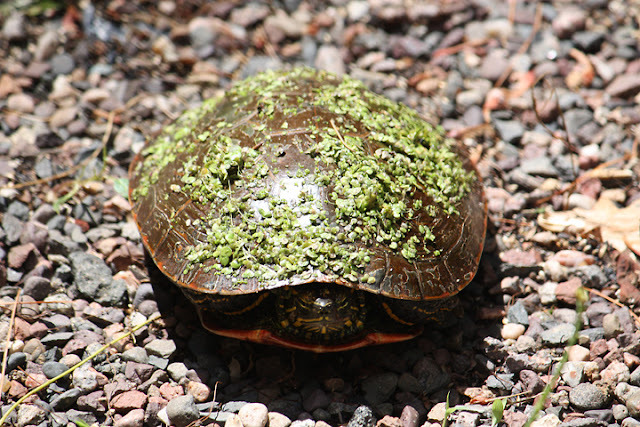 He hung his nose over the edge of the front of the boat. 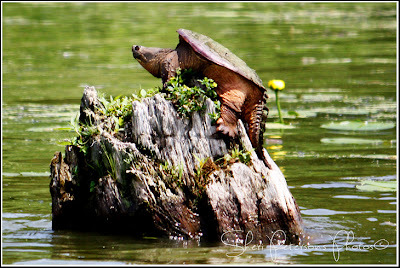 It's a very good thing that he's a little too chubby to fit through the opening because his nose was wiggling and smelling the entire time, and we went pass plenty of critters, including a huge "only a mother could love that face" snapping turtle. Can you just imagine what would have happened if Brutus would have gone after that guy? I don't think that Brutus would have won! When we got back we sat around the camp fire for a while, and Brutus worked at thinning out the mouse population in the wood pile. He is possessed with the mice, chipmunks and moles at the lake, and the wood piles seem to be one of the best places to find them. The other place is any kind of tube, especially the downspouts. 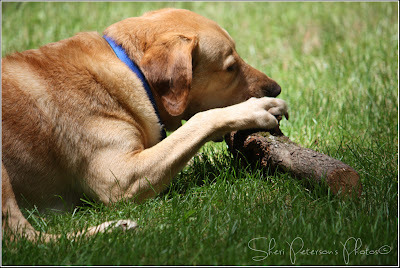 Our biggest challenge has been trying to train him to stay in our own yard so if he happens to get his nose stuck on the trail of a rodent and goes after it, the damage stays on our property. Brutus has done some damage to a couple of our neighbors property going after rodents, and we always feel so awful. Once he gets that smell in his nose, no amount of yelling or calling or bribing will get his mind off of it. It makes everyone crazy! 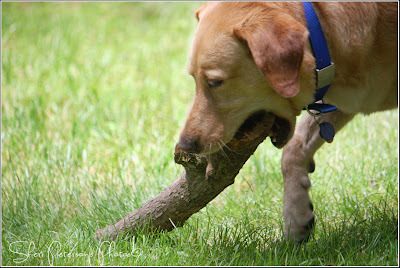 Anyway, he picked this particular log out of the wood pile and brought it over by us. He chewed on it, dropped it, sniffed it, scratched at it, spun around, dropped and repeated the whole process. He's done this before, and managed to come out with a critter. I can't imagine how scared whatever was inside the log was. Imagine being inside of a tube and watching these big teeth coming at you, knowing that you were going to be in that mouth. Ugh. Well, Don just couldn't stand it. 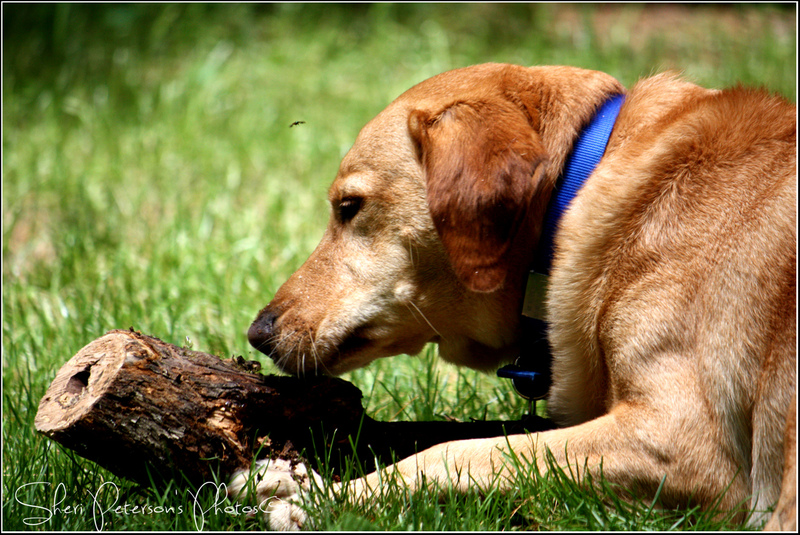 He took a stick and poked it through the hole in the log and pushed out a mouse nest. There weren't any mice in it anymore, so I'm sure that Brutus was just smelling the remnants of what used to be there, but the look on his face was priceless. It was kind of like taking a piece of candy away from a child. Plus, if Brutus is entertained with something that actually isn't hurting anything, you leave him ALONE!! So, it was back to the swimming pool to hang out for a while. Ahhhh, a dog's life. 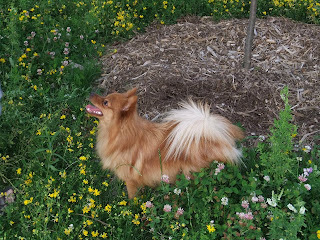 My name is Sheri, and my blogging started so I could share my first experience as a dog owner, and the experience of welcoming a rescue dog into our home, which has been absolutely amazing. From there, it grew into a new love of photography, which led to the second blog. Now that I have been introduced to so many incredible people out here in the blog world, I decided I wanted a place to just visit and share ideas, recipes and thoughts, which led to my third blog. There are times where you may need to read at your own risk. lol! !